ProBirth - Be A Parent By Yourself. GRS 4000 - Baby backpack. With the GRS 4000 men now have the opportunity to carry their children to full term. What an amazing feeling! Would you like to find out more? Then simply send us an email and set up an appointment with us. We will take care of the biological support – and you can individually set up your own GRS 4000. From the simple color choice all the way to the important decision, if you would like to carry out one child or maybe even twins. 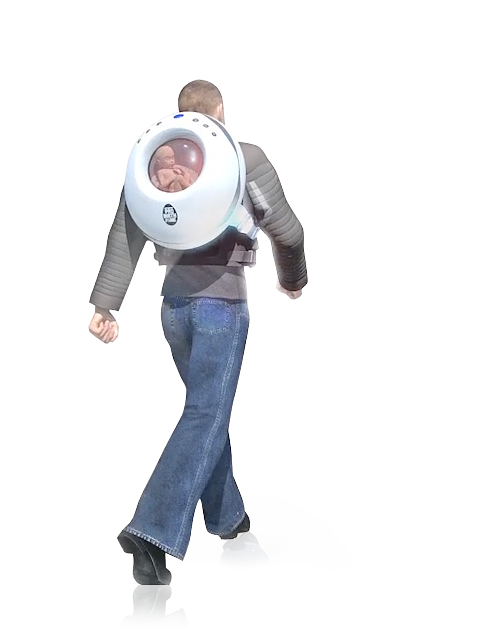 The baby backpack is now available in the world’s first revolutionary twins version. Already after a few weeks, after the first stage of fertilization, you can completely follow the development stages through a special viewing window. You will be able to see, how your offspring slowly grows. Important benchmark data concerning the various development stages will be displayed on the monitor screen. An if you are low on amniotic fluid, then simply order more from our online shop. That’s how easy childbirth is today.